One of our all time favorites with slightly sweet, substantial crunchy shoots. It should be grown only in soil and prefers a dryer soil with less frequent drench watering. 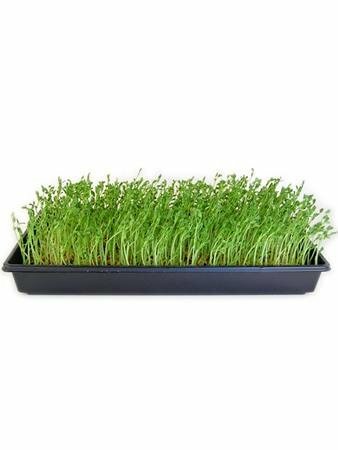 Notes & Growing Tips: Dun pea microgreens are very easy to grow but only in soil. 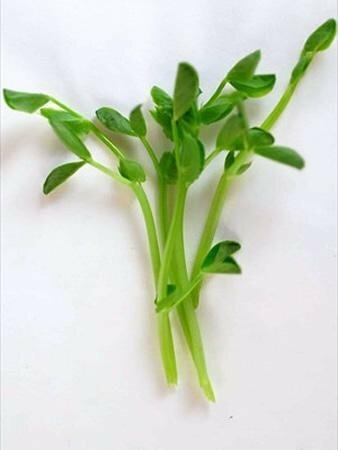 Growing pea greens is very difficult hydroponically. This 12 Oz. bag of Dun Pea microgreen seeds is premeasured for planting in our 21" x 11" tray. Soak seeds in cold water for half a day to a day. 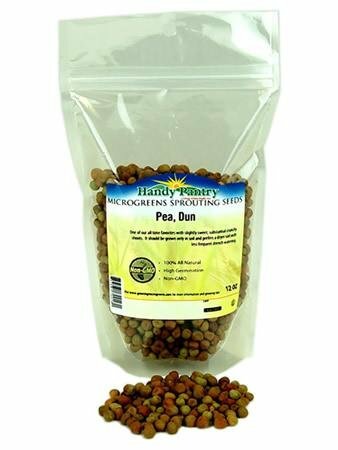 Make sure you use plenty of water and a large bowl, as dun pea seeds soak up large amounts of water. You can plant directly, but we prefer to transfer to a colander. Rinse 2 to 4 times a day in the colander for another day or two until the seedlings begin to peek out. Tamp the soil gently to flatten. Spread evenly (they should be quite thick) and tamp very gently to insure contact with the soil. Mist thoroughly twice a day. Keep covered with the blackout/humidity dome for 3 to 4 more days before exposing light. Water once a day so the soil is damp but not soggy. The pea shoots are sweet and delicious and fairly straight and leafy. They make a great garnish or addition to any salad.